We have just arrived back from Stornoway on the Isle of Lewis in the Outer Hebrides where we met some very nice people and installed a time-lapse system to cover a major construction project taking place on the Island. We really enjoyed this installation, which was in such a beautiful part of the world. All is going well as we continue our time-lapse project for Legoland at their main model building workshop in Windsor. The model builders have been working quickly as we take a frame every few minutes to ensure a great time-lapse sequence that will capture every detail of the build. We have made the images available for our clients at Legoland to view through our server and via our new smartphone enabled viewer. We’re having some great feedback from clients who are using their mobile phones with our newly developed smartphone enabled viewer to review their projects while they’re on the move. Our IRIS viewer is unique to Hideaway Time-Lapse Systems, and a further example of how we’re continuing to innovate and evolve. We have de-rigged the time-lapse camera system at Chessington World of Adventure and are beginning to assemble the edit, which looks stunning! The camera was set to get some great lighting effects – and with our normally high capture rate – we have some great images which we are now working to edit together, using our own unique editing system, which processes images through four editing stages to get the absolute best possible results. After preparing and testing out a time-lapse camera system for Legoland, we installed it yesterday in the main model building workshop in Windsor. We installed on a specially constructed scaffold to get the camera system in an ideal position to capture the building of a major Lego model destined for the U.S.A.
Over two days we supplied a fully ‘manned’ time-lapse camera system to capture the construction of a marquee at Chessington World of Adventures in Surrey. Since then, we have set up an unmanned time lapse camera system inside the marquee to capture the construction of lighting and staging, a concert, and the eventual de-rigging. We use our highly adaptive scaffolding system both to get the camera in the most advantageous position and to provide it with a very stable and safe operating platform. 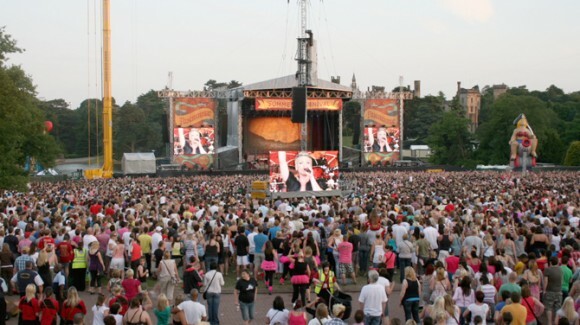 We have now time-lapsed the stage construction, the concert itself and the de-rigging of the stage, for the concert by Pink, which took place at the Alton Towers Resort on 27th June…. We now look forward to putting together the edit. The construction of carpark we have been time-lapsing for Condek at a Tesco store in Bromley, Greater London is now complete and we are de-rigging the camera system… The job has progressed without a hitch and we now look forward to following instructions from our client, Condek, for the compilation of the edit.